An estimated crowd of 860,000 gathered as Pope Francis celebrated Mass before heading back to Vatican City. Some New Englanders were pleased to make the pilgrimage. "It was very emotional. Very, very emotional." said Lisa White of Boston's Jamaica Plain neighborhood. "It's very, very spiritual for me because I'm a born Catholic." Others were moved by the experience, too. "Oh my goodness, it was amazing. It was amazing," said Joyce Detweiler of Easton, Pennsylvania. "The best thing of all my granddaughter was here." For one final time, Pope Francis was in full view for all to see. 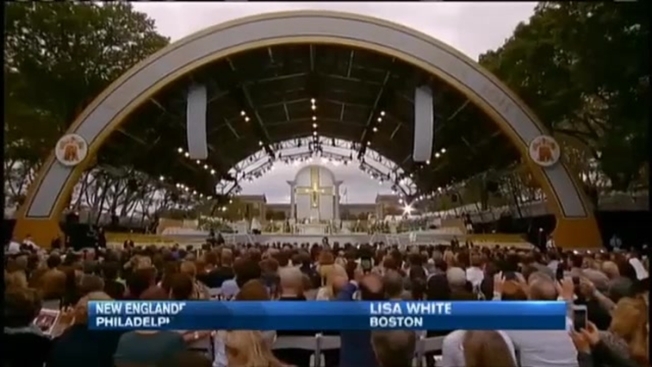 Passing right by necn's camera, he took one final ride in the Popemobile. "Oh, it's a surreal experience," said a student of Assumption College. A large group of students from the College of the Holy Cross and Assumption College, both in Worcester, Massachusetts, drove down just for this. "This is an amazing opportunity that I'm super grateful to be a part of," said Connor Zanini of Holy Cross. It's a special journey for these students - especially for the freshmen who started school just one month ago. "It was great to be able to have this opportunity," said Cece Garner of Holy Cross. "This is absolutely astounding. It's, the magnitude of this event, is so much bigger than I could even imagine in my mind," said Lillian Piz of Holy Cross.